Thin brick pioneer Ambrico (https://ambrico.com) has completed the restoration of the Second Baptist Church of Detroit in just 10 weeks, providing Second Baptist with a historically accurate look while preserving an important part of the nation’s past. Located in Detroit, Michigan, in the Greektown cultural district, the historic, multi-story Baptist church and office space included three building add-ons to the original facility. The exterior facade consists of 10,000 square feet of stucco, making up 80 percent of the total surface area. Numerous windows of varying sizes and shapes enhance curb appeal on the front of the structure. 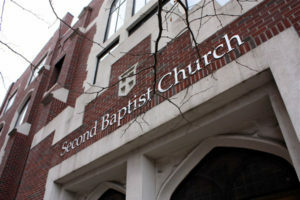 Founded in 1836, the Second Baptist Church of Detroit is the oldest African-American church in Michigan, located at its current address since 1857. Situated in Detroit’s historic Greektown district, replacement of the exterior cladding would improve overall building aesthetics, and also protect this facility from further deterioration due to exposure to the elements. This project demonstrated the company’s ability to maintain the integrity of this historically significant structure, enhance the building’s visual appeal and duplicate architectural elements of the neighborhood through use of alternative cladding systems while preserving the appeal of traditional masonry. The church clergy sought to restore the original masonry look of the structure and meet cost targets. An earlier stucco overlay applied to the building’s original brick facade had left the surface pitted and uneven, eliminating the option of restoring the original masonry. The materials to be selected needed to produce a brick appearance, minimize cost, and without the added weight of full brick. Original architectural elements, such as the returns to window and door openings, needed to be preserved without adding significant depth. With special fasteners, EZ-Wall® thin brick panels were attached to the building’s original facade surface. Thin brick was then applied to the panels, producing the durability of brick at a overall depth of only 5/8″. The EZ-Wall® thin brick veneer panels are architectural steel grade, embossed, hot dipped galvanized to G-90 finish and have approximately the same thermal coefficient as brick and mortar. Double steel tabs on the panel penetrate the mortar and space the thin bricks horizontally. Continuous weeps, a design element of the system, aid in drainage of incidental moisture. The use of thin brick eliminated the need for lintels over doors and windows, reducing overall project cost. Additionally, the panels were completed with full depth mortar joints to ensure long-term durability and strength, indistinguishable from traditional masonry. As a result, the restoration was completed in approximately 10 weeks, and Ambrico was able to provide Second Baptist with the warm and historically accurate look and feel they wanted—at a price within their budget.